Sonochemistry is the effect of ultrasonic cavitation on chemical systems. Due to the extreme conditions that occur in the cavitational “hot spot”, power ultrasound is an very effective method to improve reaction outcome (higher yield, better quality), conversion and duration of a chemical reaction. Some chemical changes can be achieved under sonication only, such as the nano-sized tin-coating of titanium or aluminum. Find below a selection of particles and liquids with related recommendations, how to treat the material in order to mill, disperse, deagglomerate or modify the particles using an ultrasonic homogenizer. Find below some sonication protocols for successful sonochemical reactions! faster than the system without sonication. 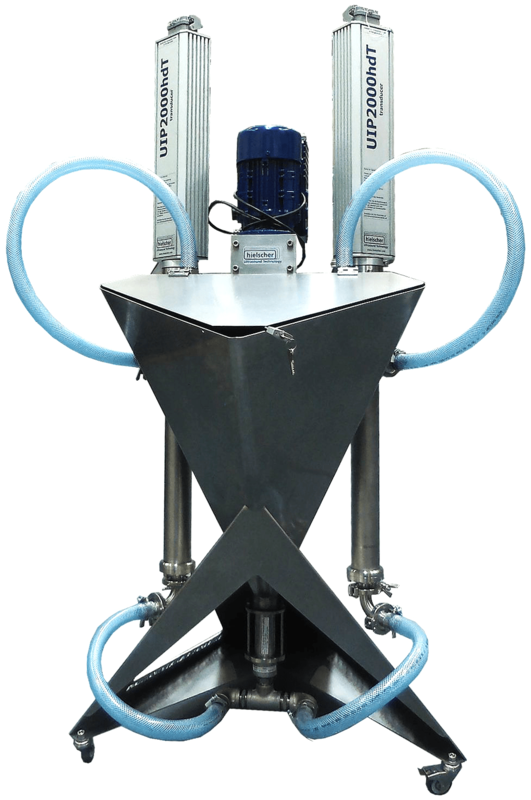 The higher yields and shorter reaction times are advantages of this method. α-Epoxyketones 1a-f and 1-benzyl-2,4,6-triphenylpyridinium tetrafluoroborate 2 were prepared according to the reported procedures. Methanol was purchased from Merck and distilled before use. The ultrasonic device used was an UP400S ultrasonic probe-device from Hielscher Ultrasonics GmbH. A S3 ultrasonic immersion horn (also known as probe or sonotrode) emitting 24 kHz ultrasound at intensity levels tunable up to maximum sonic power density of 460Wcm-2 was used. Sonication was carried out at 100% (maximum amplitude 210μm). The sonotrode S3 (maximum immerse depth of 90mm) was immersed directly into the reaction mixture. UV irradiations were performed using a 400W high pressure mercury lamp from Narva with cooling of samples in Duran glass. The 1H NMR spectra of the mixture of photoproducts were measured in CDCl3 solutions containing tetramethylsilane (TMS) as internal standard on a Bruker drx-500 (500 MHz). Preparative layer chromatography (PLC) was carried out on 20 × 20cm2 plates coated with 1mm layer of Merck silica gel PF254 prepared by applying the silica as a slurry and drying in air. All products are known and their spectral data have been reported earlier. Memarian, Hamid R.; Saffar-Teluri, A. (2007): Photosonochemical catalytic ring opening of α-epoxyketones. Beilstein Journal of Organic Chemistry 3/2, 2007. SonoStation – Hielscher’s ultrasonic system with 2x 2kW ultrasonicators, stirred tank and pump – is a user-friendly system for ultrasonic processing. Al/Ni particles can be sonochemically modified by the nano-structuring of initial Al/Ni alloy. Therbey, an effective catalyst for the hydrogenation of acetophenone is produced. 5g of the commercial Al/Ni alloy were dispersed in purified water (50mL) and sonicated up to 50 min. with the ultrasound probe-type device UIP1000hd (1kW, 20kHz) equipped with the ultrasonic horn BS2d22 (head area of 3.8 cm2) and the booster B2-1.8. The maximum intensity was calculated to be 140 Wcm−2 at mechanical amplitude of 106μm. To avoid the temperature increase during sonication the experiment was performed in a thermostatic cell. After sonication, the sample was dried under vacuum with a heat gun. The transesterification reaction was studied under constant ultrasonic mixing with an UP200S for different parameters like catalyst quantity, the molar ratio of methanol and oil, reaction temperature and reaction duration. The batch experiments were performed in a hard glass reactor (300 ml, 7 cm internal diameter) with two neck grounded lid. One neck was connected with titanium sonotrode S7 (tip diameter 7 mm) of the ultrasonic processor UP200S (200W, 24kHz). The ultrasound amplitude was set at 50% with 1 cycle per second. The reaction mixture was sonicated throughout the reaction time. The other neck of the reactor chamber was fitted with a customized, water-cooled, stainless steel condenser to reflux the evaporated methanol. The whole apparatus was placed in a constant temperature oil bath controlled by a proportional integral derivative temperature controller. The temperature can be raised up to 65°C with an accuracy of ±1°C. Waste oil, 99.9% pure methanol were used as material for the biodiesel transesterification. Smoke deposited nano-sized MgO (magnesium ribbon) was used as catalyst. An excellent result of conversion was obtained at 1.5 wt% catalyst; 5:1 methanol oil molar ratio at 55°C, a conversion of 98.7% was achieved after 45 min. Sivakumar, P.; Sankaranarayanan, S.; Renganathan, S.; Sivakumar, P.(): Studies on Sono-Chemical Biodiesel Production Using Smoke Deposited Nano MgO Catalyst. Bulletin of Chemical Reaction Engineering & Catalysis 8/ 2, 2013. 89 – 96. Cadmium(II)-thioacetamide nanocomposites were synthesized in the presence and absence of polyvinyl alcohol via sonochemical route. For the sonochemical synthesis (sono-synthesis), 0.532 g of cadmium (II) acetate dihydrate (Cd(CH3COO)2.2H2O), 0.148 g of thioacetamide (TAA, CH3CSNH2) and 0.664 g of potassium iodide (KI) were dissolved in 20mL double distilled deionized water. This solution was sonicated with a high-power probe-type ultrasonicator UP400S (24 kHz, 400W) at room temperature for 1 h. During the sonication of the reaction mixture the temperature increased to 70-80degC as measured by an iron–constantin thermocouple. After one hour a bright yellow precipitate formed. It was isolated by centrifugation (4,000 rpm, 15 min), washed with double distilled water and then with absolute ethanol in order to remove residual impurities and finally dried in air (yield: 0.915 g, 68%). Dec. p.200°C. To prepare of polymeric nanocomposite, 1.992 g of polyvinyl alcohol was dissolved in 20 mL of double distilled deionized water and then added into the above solution. This mixture was irradiated ultrasonically with the UP400S for 1 h when a bright orange product formed. The SEM results demonstrated that in presence of PVA the sizes of the particles decreased from about 38 nm to 25 nm. Then we synthesized hexagonal CdS nanoparticles with spherical morphology from thermal decomposition of the polymeric nanocomposite, cadmium(II)-thioacetamide/PVA as precursor. The size of the CdS nanoparticles was measured both by XRD and SEM and the results were in very good agreement with each other. Ranjbar et al. (2013) also found that the polymeric Cd(II) nanocomposite is a suitable precursor for the preparation of cadmium sulfide nanoparticles with interesting morphologies. All results revealed that ultrasonic synthesis can be employed successfully as a simple, efficient, low cost, environmentally friendly and very promising method for the synthesis of nanoscale materials without a need for special conditions, such as high temperature, long reaction times, and high pressure. Ranjbar, M.; Mostafa Yousefi, M.; Nozari, R.; Sheshmani, S. (2013): Synthesis and Characterization of Cadmium-Thioacetamide Nanocomposites. Int. J. Nanosci. Nanotechnol. 9/4, 2013. 203-212. Ultrasonic coating of nano-precipitated CaCO3 (NPCC) with stearic acid to improve its dispersion in polymer and to reduce agglomeration. 2g of uncoated nano-precipitated CaCO3 (NPCC) has been sonicated with an UP400S in 30ml ethanol. 9 wt% of stearic acid has been dissolved in ethanol. Ethanol with stearic acid was then mixed with the sonificated suspension. Kow, K. W.; Abdullah, E. C.; Aziz, A. R. (2009): Effects of ultrasound in coating nano-precipitated CaCO3 with stearic acid. Asia‐Pacific Journal of Chemical Engineering 4/5, 2009. 807-813. Cold-rolled carbon steel panels (6.5cm, 6.5cm, 0.3cm; chemically cleaned and mechanically polished) were used as metallic substrates. Prior to the coating application, the panels were ultrasonically cleaned with acetone then cleaned by an alkaline solution (0.3mol L1 NaOH solution) at 60°C for 10 min. For using as a primer, prior to substrate pretreatment, a typical formulation including 50 parts of γ-glycidoxypropyltrimethoxysilane (γ-GPS) was diluted with about 950 parts of methanol, in pH 4.5 (adjusted with acetic acid) and allowed for the hydrolysis of silane. Preparation procedure for doped silane with cerium nitrate pigments was the same, except that 1, 2, 3 wt% of cerium nitrate was added to the methanol solution prior to (γ-GPS) addition, then this solution was mixed with a propeller stirrer at 1600 rpm for 30 min. at room temperature. Then, the cerium nitrate containing dispersions were sonicated for 30 min at 40°C with an external cooling bath. The ultrasonication process was performed with the ultrasonicator UIP1000hd (1000W, 20 kHz) with an inlet ultrasound power of around 1 W/mL. Substrate pretreatment was carried out by rinsing each panel for 100 sec. with the appropriate silane solution. After treatment, the panels were allowed to dry at room temperature for 24 h, then the pretreated panels were coated with a two-pack amine-cured epoxy. (Epon 828, shell Co.) to make 90μm wet film thickness. Epoxy coated panels were allowed to cure for 1h at 115°C, after curing of epoxy coatings; the dry film thickness was about 60μm. Zaferani, S.H. ; Peikari, M.; Zaarei, D.; Danaei, I. (2013): Electrochemical effects of silane pretreatments containing cerium nitrate on cathodic disbonding properties of epoxy coated steel. Journal of Adhesion Science and Technology 27/22, 2013. 2411–2420. Porous copper–aluminium stabilized by metal oxide is a promising new alternative catalyst for propane dehydrogenation which is free of noble or hazardous metals. The structure of the oxidized porous Cu–Al alloy (metal sponge) is similar to Raney-type metals. High-power ultrasound is a green chemistry tool for the synthesis of porous copper–aluminum frameworks stabilized by metal oxide. They are inexpensive (production cost of approx. 3 EUR/liter) and the method can be easily scaled-up. These new porous materials (or “metal sponges”) have an alloy bulk and an oxidized surface, and can catalyze propane dehydrogenation at low temperatures. 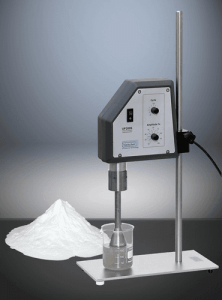 Five grams of the Al–Cu alloy powder were dispersed in ultrapure water (50mL) and sonicated for 60 min with Hielscher’s UIP1000hd ultrasonicator (20kHz, max. output power 1000W). The ultrasound probe-type device was equipped with a sonotrode BS2d22 (tip area 3.8cm2) and the booster horn B2–1.2. The maximum intensity was calculated to be 57 W/cm2 at a mechanical amplitude of 81μm. During the treatment the sample was cooled in an ice bath. After the treatment, the sample was dried at 120°C for 24 h.
Schäferhans, Jana; Gómez-Quero, Santiago; Andreeva, Daria V.; Rothenberg, Gadi (2011): Novel and Effective Copper–Aluminum Propane Dehydrogenation Catalysts. Chem. Eur. J. 2011, 17, 12254-12256. Copper phathlocyanine is sonicated with water and organic solvents at ambient temperature and atmospheric pressure in the presence of catalytic amount of oxidant using the 500W ultrasonicator UIP500hd with fold-trough chamber at a power level of 37–59 W/cm2: 5 mL of sample (100 mg/L), 50 D/D water with choloform and pyridine at 60% of ultrasonic amplitude. Reaction temperature: 20°C. Gold nano particles were morphologically modified under intense ultrasonic irradiation. To fuse gold nanoparticles into a dumbbell-like structure a ultrasonic treatment of 20 min. in pure water and in the presence of surfactants was found sufficient. After 60 min. of sonication, the gold nanoparticles acquire a worm-like or ring-like structure in water. Fused nanoparticles with spherical or oval shapes were ultrasonically formed in the presence of sodium dodecyl sulfate or dodecyl amine solutions. For the ultrasonic modification, the colloidal gold solution, consisting in preformed citrate-protected gold nanoparticles with an average diameter of 25nm (± 7nm), were sonicated in a closed reactor chamber (approx. 50mL volume). The colloidal gold solution (0.97 mmol·L-1) was ultrasonically irradiated at high intensity (40 W/cm-2) using a Hielscher UIP1000hd ultrasonicator (20kHz, 1000W) equipped with a titanium alloy sonotrode BS2d18 (0.7 inch tip diameter), which was immersed about 2 cm below the surface of the sonicated solution. The colloidal gold was gassed with argon (O2 < 2 ppmv, Air Liquid) 20 min. before and during sonication at a rate of 200 mL·min-1 to eliminate the oxygen in the solution. A 35-mL portion of each surfactant solution without addition of trisodium citrate dihydrate was added by 15 mL of preformed colloidal gold, bubbled with an argon gas 20 min. before and during ultrasonic treatment. Radziuk, D.; Grigoriev,D. ; Zhang, W.; Su, D.; Möhwald, H.; Shchukin, D. (2010): Ultrasound-Assisted Fusion of Preformed Gold Nanoparticles. Journal of Physical Chemistry C 114, 2010. 1835–1843. 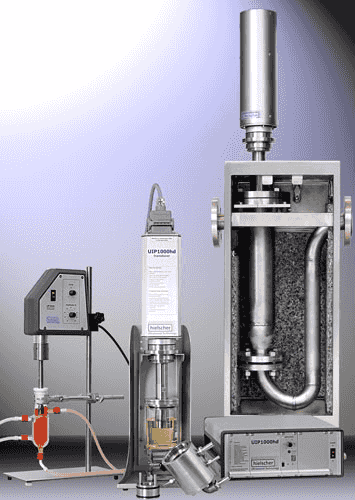 For the ultrasonic extraction of copper, lead and cadmium, samples containing a mixture of fertilizer and solvent are sonicated with an ultrasonic device such as the VialTweeter (indirect sonication). The fertilizer samples were sonicated in the presence of 2mL of 50% (v/v) HNO3 in glass tubes for 3 minutes. The extracts of Cu, Cd and Pb can be determined by flame atomic absorption spectrometry (FAAS). Lima, A. F.; Richter, E. M.; Muñoz, R. A. A. (2011): Alternative Analytical Method for Metal Determination in Inorganic Fertilizers Based on Ultrasound-Assisted Extraction. Journal of the Brazilian Chemical Society 22/ 8. 2011. 1519-1524. Poly(styrene-r-butyl acrylate) P(St-BA) latex particles were synthesized by emulsion polymerization in the presence of surfactant DBSA. 1 g of DBSA was first dissolved in 100mL of water in a three-necked flask and the pH value of the solution was adjusted to 2.0. Mixed monomers of 2.80g St and 8.40g BA with the initiator AIBN (0.168g) were poured into the DBSA solution. The O/W emulsion was prepared via magnetic stirring for 1 h followed by sonication with an UIP1000hd equipped with ultrasonic horn (probe/ sonotrode) for another 30 min. in the ice bath. Finally, the polymerization was carried out at 90degC in an oil bath for 2h under a nitrogen atmosphere. Fabrication of flexible conductive films derived from poly(3,4-ethylenedioxythiophene)epoly(styrenesulfonic acid) (PEDOT:PSS) on the nonwoven fabrics substrate. Materials Chemistry and Physics 143, 2013. 143-148. Click here to read more about the sono-synthesis of latex! The ultrasound leaching experiments were performed with an ultrasonic device UP400S with a titanium sonic probe (diameter 14mm), which operates at a frequency of 20kHz. The ultrasonic probe (sonotrode) was calorimetrically calibrated with the ultrasonic intensity set to 51 ± 0.4 W cm-2 for all the sono-leaching experiments. The sono-leaching experiments were thermostated using a flat bottom jacketed glass cell at 25 ± 1°C. Three systems were employed as soil leaching solutions (0.1L) under sonication: 6 mL of 0.3 mol L-2 of acetic acid solution (pH 3.24), 3% (v/v) nitric acid solution (pH 0.17) and a buffer of acetic acid/acetate (pH 4.79) prepared by mixing 60mL 0f 0.3 mol L-1 acetic acid with 19 mL 0.5 mol L-1 NaOH. After the sono-leaching process, samples were filtered with filter paper to separate the leachate solution from soil followed by lead electrodeposition of the leachate solution and digestion of soil after the application of ultrasound. Ultrasound has been proven to be a valuable tool in enhancing the leachate of lead from pollute soil. Ultrasound is also an effective method for the near total removal of leachable lead from soil resulting in a much less hazardous soil. Sandoval-González, A.; Silva-Martínez, S.; Blass-Amador, G. (2007): Ultrasound Leaching and Electrochemical Treatment Combined for Lead Removal Soil. Journal of New Materials for Electrochemical Systems 10, 2007. 195-199. At room temperature, 0.151 g lead acetate (Pb(CH3COO)2.3H2O) and 0.03 g of TAA (CH3CSNH2) were added to 5mL of the ionic liquid, [EMIM] [EtSO4], and 15mL of double distilled water in a 50mL beaker imposed to ultrasonic irradiation with an UP200S for 7 min. The tip of the ultrasonic probe/ sonotrode S1 was immersed directly in the reaction solution. The formed dark brown color suspension was centrifuged to get the precipitate out and washed two times with double distilled water and ethanol respectively to remove the unreacted reagents. To investigate the effect of ultrasound on the properties of the products, one more comparative sample was prepared, keeping the reaction parameters constant except that the product is prepared at continuous stirring for 24 h without the aid of ultrasonic irradiation. Ultrasonic-assisted synthesis in aqueous ionic liquid at room temperature was proposed for preparation of PbS nanoparticles. This room-temperature and environmentally benign green method is fast and template-free, which shortens synthesis time remarkably and avoids the complicated synthetic procedures. The as-prepared nanoclusters show an enormous blue shift of 3.86 eV that can be attributed to very small size of particles and quantum confinement effect. Behboudnia, M.; Habibi-Yangjeh, A.; Jafari-Tarzanag, Y.; Khodayari, A. (2008): Facile and Room Temperature Preparation and Characterization of PbS Nanoparticles in Aqueous [EMIM][EtSO4] Ionic Liquid Using Ultrasonic Irradiation. Bulletin of Korean Chemical Society 29/ 1, 2008. 53-56. Rokhina et al. (2013) used the combination of peracetic acid (PAA) and heterogeneous catalyst (MnO2) for the degradation of phenol in an aqueous solution under ultrasonic irradiation. Ultrasonication was carried out using a 400W probe-type ultrasonicator UP400S, which is capable to sonicate either continuously or in pulse mode (i.e. 4 sec. on and 2 sec. off) at a fixed frequency of 24 kHz. The calculated total power input, power density and power intensity dissipated to the system were 20 W, 9.5×10-2 W/cm-3, and 14.3 W/cm-2, respectively. The fixed power has been used throughout the experiments. Immersion circulator unit was used to control temperature inside the reactor. The actual sonication time was 4 h, although the real reaction time was 6 h due to the operation in the pulsed mode. In a typical experiment, the glass reactor was filled with 100mL of phenol solution (1.05 mM) and appropriate doses of the catalyst MnO2 and PAA (2%), ranging between 0–2 g L-1 and 0–150 ppm, respectively. All reactions were performed at circum neutral pH, atmospheric pressure and a room temperature (22 ± 1 °C). By ultrasonication, the surface area of the catalyst was increased resulting in a 4-fold larger surface area with no change in the structural. The turnover frequencies (TOF) were increased from 7 x 10-3 to 12.2 x 10-3 min-1, in comparison to the silent process. In addition, no significant leaching of the catalyst was detected. The isothermal oxidation of phenol at relatively low concentrations of reagents demonstrated high removal rates of phenol (up to 89%) at mild conditions. In general, ultrasound accelerated the oxidation process during first 60 min. (70% of phenol removal vs. 40% during the silent treatment). Rokhina, E. V.; Makarova, K.; Lahtinen, M.; Golovina, E. A.; Van As, H.; Virkutyte, J. (2013): Ultrasound-assisted MnO2 catalyzed homolysis of peracetic acid for phenol degradation: The assessment of process chemistry and kinetics. Chemical Engineering Journal 221, 2013. 476–486. 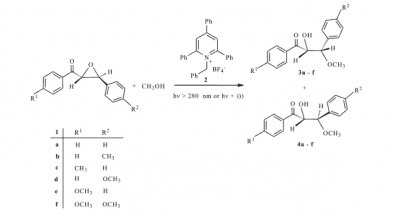 Heterogeneous aqueous oxidation of phenol over RuI3 with hydrogen peroxide (H2O2): The catalytic oxidation of phenol (100 ppm) over RuI3 as a catalyst was studied in a 100 mL glass reactor equipped with a magnetic stirrer and a temperature controller. The reaction mixture was stirred at a speed of 800 rpm for 1–6 hours to provide a complete mixing for uniform distribution and full suspension of catalysts particles. No mechanical stirring of the solution was performed during sonication due to the disturbance caused by cavitation bubble oscillation and collapse, providing itself an extremely efficient mixing. Ultrasound irradiation of the solution was carried out with an ultrasonic transducer UP400S equipped with ultrasonic (so-called probe–type sonicator), capable of operating either continuously or in a pulse mode at a fixed frequency of 24 kHz and a maximum power output of 400W. For the experiment, untreated RuI3 as catalyst (0.5–2 gL-1) was introduced as a suspension to the reaction medium with following H2O2 (30%, concentration in the range of 200–1200 ppm) addition. Rokhina et al. found in their study that ultrasonic irradiation played a prominent role in the modification of catalyst’s textural properties, producing the microporous structure with higher surface area as a result of fragmentation of the catalyst particles. Moreover, it had a promotional effect, preventing agglomeration of the catalyst particles and improving the accessibility of phenol and hydrogen peroxide to the active sites of the catalyst. The two–fold increase in ultrasound–assisted process efficiency in comparison to the silent oxidation process was attributed to the improved catalytic behaviour of the catalyst and generation of oxidizing species such as •OH, •HO2 and •I2 via hydrogen bonds cleavage and recombination of radicals. Rokhina, E. V.; Lahtinen, M.; Nolte, M. C. M.; Virkutyte, J. (2009): Ultrasound-Assisted Heterogeneous Ruthenium Catalyzed Wet Peroxide Oxidation of Phenol. Applied Catalysis B: Environmental 87, 2009. 162– 170. PLA coating of Ag/ZnO particles: Micro- and submicro-particles of Ag/ZnO coated with PLA were prepared by the oil-in-water emulsion solvent evaporation technique. This method was carried out in the following way. Firstly, the 400 mg of polymer was dissolved in 4 ml of chloroform. The resulting concentration of polymer in chloroform was 100 mg/ml. Secondly, the polymer solution was emulsified in water solution of various surfactant systems (emulsifying agent, PVA 8-88) under continuous stirring with homogenizer at stirring speed of 24,000 rpm. The mixture was stirred for 5 min. and during this period the forming emulsion was cooled with ice. The ratio between water solution of surfactant and chloroform solution of PLA was identical in all experiments (4:1). Subsequently, the obtained emulsion was ultrasonicated by an ultrasonic probe-type device UP400S (400W, 24kHz) for 5 min. at cycle 0.5 and amplitude 35%. Finally, the prepared emulsion was transferred into the Erlenmeyer flask, stirred, and the organic solvent was evaporated from the emulsion under reduced pressure which finally leads to the formation of particle suspension. After solvent removal the suspension was centrifuged three times to remove the emulsifier. Kucharczyk, P.; Sedlarik, V.; Stloukal, P.; Bazant, P.; Koutny, M.; Gregorova, A.; Kreuh, D.; Kuritka, I. (2011): Poly (L-Lactic Acid) Coated Microwave Synthesized Hybrid Antibacterial Particles. Nanocon 2011. To prepare the water-based SPAni composite, 0.3 gr SPAni, synthesized using in-situ polymerization in ScCO2 medium, was diluted with water and sonicated for 2 minutes by an 1000W ultrasonic homogenizer UIP1000hd. Then, the suspension product was homogenized by adding 125 gr water-based hardener matrix for 15 min. and the final sonication was carried out at ambient temperature for 5 min. Bagherzadeh, M.R. ; Mousavinejad, T.; Akbarinezhad, E.; Ghanbarzadeh, A. (2013): Protective Performance of Water-Based Epoxy Coating Containing ScCO2 Synthesized Self-Doped Nanopolyaniline. 2013. For the sonochemical degradation of polycyclic aromatic hydrocarbons (PAHs) naphthalene, acenaphthylene and phenanthrene in water, sample mixtures were sonicated at 20◦C and 50 µg/l of each target PAH (150 µg/l of total initial concentration). Ultrasonication was applied by an UP400S horn-type ultrasonicator (400W, 24kHz), which is capable of operating either in continuous or in pulse mode. The ultrasonic device UP400S was equipped with a titanium probe H7 with 7 mm diameter tip. The reactions were carried out in a 200 mL cylindrical glass reaction vessel with the titanium horn mounted on top of the reaction vessel and sealed using O-rings and a Teflon valve. The reaction vessel was placed in a water bath to control the process temperature. To avoid any photochemical reactions, the vessel was covered with aluminium foil. The analysis results showed that the conversion of PAHs increases with increasing sonication duration. For naphthalene, the ultrasonically assisted conversion (ultrasound power set to 150W) increased from 77.6% achieved after 30 min. sonication to 84.4% after 60 min. sonication. For acenaphthylene, the ultrasonically assisted conversion (ultrasound power set to 150W) increased from 77.6% achieved after 30 min. sonication with 150W ultrasound power to 84.4% after 60 min. sonication with 150W ultrasound increased from 80.7% achieved after 30 min. sonication with 150W ultrasound power to 96.6% after 60 min. sonication. For phenanthrene, the ultrasonically assisted conversion (ultrasound power set to 150W) increased from 73.8% achieved after 30 min. sonication to 83.0% after 60 min. sonication. To enhance degradation efficiency, hydrogen peroxide can be utilized more efficient when ferrous ion is added. The addition of ferrous ion has been shown to have synergetic effects simulating a Fenton-like reaction. 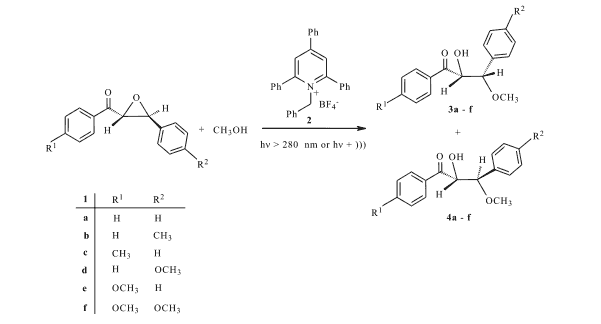 Psillakis, E.; Goula, G.; Kalogerakis, N.; Mantzavinos, D. (2004): Degradation of polycyclic aromatic hydrocarbons in aqueous solutions by ultrasonic irradiation. Journal of Hazardous Materials B108, 2004. 95–102. To prepare the substrate before growing CuO nanowires on Cu substrates, the intrinsic oxide layer on the Cu surface was removed by ultrasonicating the sample in 0.7 M hydrochloric acid for 2 min. with an Hielscher UP200S. The sample was ultrasonically cleaned in acetone for 5 min. to remove organic contaminants, thoroughly rinsed with deionized (DI) water, and dried in compressed air. Mashock, M.; Yu, K.; Cui, S.; Mao, S.; Lu, G.; Chen, J. (2012): Modulating Gas Sensing Properties of CuO Nanowires through Creation of Discrete Nanosized p−n Junctions on Their Surfaces. ACS Applied Materials & Interfaces 4, 2012. 4192−4199. For ultrasound-enhanced voltammetry experiments, a Hielscher 200 watts ultrasonicator UP200S equipped with glass horn (13-mm diameter tip) was employed. The ultrasound was applied with an intensity of 8 W/cm–2. Due to the slow rate of diffusion of nanoparticles in aqueous solutions and the high number of redox centres per nanoparticle, the direct solution-phase voltammetry of nanoparticles is dominated by adsorption effects. In order to detect nanoparticles without accumulation due to adsorption, an experimental approach has to be chosen with (i) a sufficiently high concentration of nanoparticles, (ii) small electrodes to improve the signal-to-back-ground ratio, or (iii) very fast mass transport. Therefore, McKenzie et al. (2012) employed power ultrasound to drastically improve the rate of mass transport of nanoparticles toward the electrode surface. In their experimental setup, the electrode is directly exposed to high intensity ultrasound with 5 mm electrode-to-horn distance and 8 W/cm–2 sonication intensity resulting in agitation and cavitational cleaning. A test redox system, the one-electron reduction of Ru(NH3)63+ in aqueous 0.1 M KCl, was employed to calibrate the rate of mass transport achieved under these conditions. Hielscher offers the full range of ultrasonicators from the handheld lab homogenizer up to full industrial systems for high volume streams. All results achieved in small scale during testing, R&D and optimization of an ultrasonic process, can be linearly scaled up to full commercial production. Hielscher’s ultrasonic devices are reliable, robust and built for 24/7 operation. Ask us, how to evaluate, optimize and scale your process! We are glad to assist you during all stages – from first tests and process optimization to installation in your industrial production line! Ultrasonic tissue homogenizers are used for manifold processes and industries. Depending on the ultrasonic processors’ use, they are referred to as probe-type ultrasonicator, sonic lyser, sonolyzer, ultrasound disruptor, ultrasonic grinder, sono-ruptor, sonifier, sonic dismembrator, cell disrupter, ultrasonic disperser or dissolver. The different terms point to the specific application that is fulfilled by sonication.